The line sees a reasonable amount of freight traffic for a secondary route, most of it coal from mines in the west to the Beijing area. 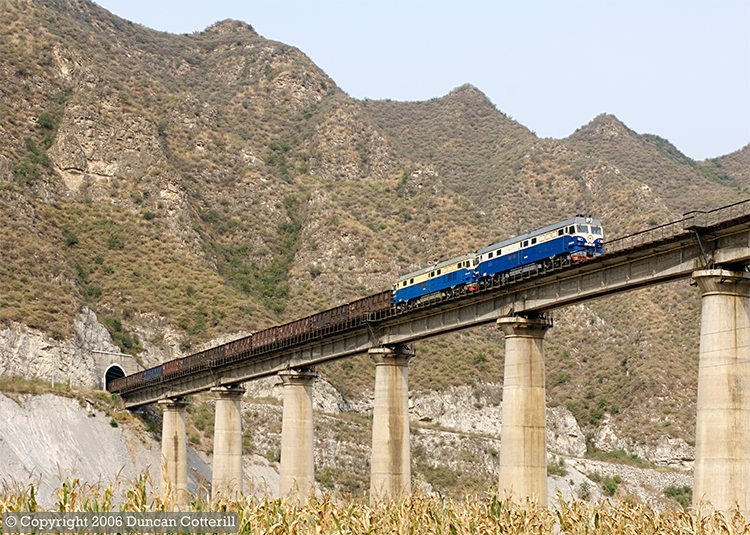 DF4 5212 and DF4D 4030 crossed one of the viaducts west of Gougezhuang with a loaded coal train on 30 September 2006. Both locos were DF4Cs, the first Ziyang built and the second a Dalian product. Fengtai based examples of the class shared freight workings with the DF4Ds while I was there. They were usually single headed but sometimes ran in pairs, as on this occasion.